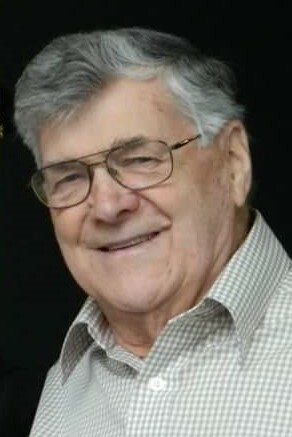 Gerald (Jerry) Lee Nadeau, 89, of Essex Junction, died peacefully on April 18, 2018 with his loving wife nearby. Gerald was born in Bridport on April 10, 1929 son of the late Gordon and Blanche (Tatro) Nadeau. Sixty-six years ago, on Valentine’s Day 1952, Jerry married the love of his life (and fellow motorcyclist), June (Dyer) Nadeau. Together they raised their two adopted sons Jay and Jeffrey. Jerry was devoted to his family. Gerald was a long-time employee of the New England Telephone Company (Ma Bell), retiring in 1984. After retiring he was able to pursue his bucket list of jobs including working in a hardware store stocking shelves and delivering flowers, especially on Valentine’s Day when he said everyone was happy to see him. He returned to Ma Bell to work as a contract engineer before completely retiring to spend more time with the next generations of their family. Jerry enjoyed family first, motorcycling and spending time at camp. He was proud of his military service after being drafted and would often talk about his time in the Army’s Airborne Division as a Paratrooper. Over the years he never lost contact with the many men he worked alongside at Fort Benning. An avid woodworker, his biggest carpentry accomplishment was building “camp” on Lake Champlain. Camp was the place of many weekend family gatherings that included boating, fishing, bonfires and water skiing. Camp later became a summer home away from home after he retired. Gerald was a member of the Bell Atlantic Telephone Pioneers, Men at First men’s choir at the First Congregational Church, and the Free Masons Ethan Allen Lodge No. 72. Gerald is survived by his loving wife June, his son Jay and wife Kathy of Milton his brother Loren “Dicky” Nadeau and wife Julia of Bridport, a sister-in-law Jean Baehr of California, his 3 grandchildren, Jeffrey, Jenna and Paige, two great grandchildren Emery and Ellie, several nieces, nephews and cousins. He was predeceased by his son Jeffrey Gordon Nadeau, his brother Harold Nadeau and sister Arlene Nadeau. Visiting hours will be held on Monday April 23, 2018 from 4:00 – 7:00 p.m. at A W Rich Funeral Home – Essex Chapel. Funeral services will be held on Tuesday April 24, 2018 at 10:00 a.m. at First Congregational Church, Essex Junction. A joint burial service with son Jeff who predeceased him last year will be will be held this summer. Memorial contributions in Gerald’s memory may be made to the Heavenly Pantry at First Congregational Church, Essex Junction. The family invites you to share your memories and condolences by visiting www.awrfh.com.